Uma casa unifamiliar lindamente remodelada em Highlands com vista sobre a entrada Shrewsbury, Twin Lights Historic Light House e Sandy Hook National Recreation Area. Apenas a alguns passos da orla e das marinas. A área oferece oportunidades fantásticas para os pescadores, velejadores, frequentadores da praia, observadores de aves e ciclistas. Uma rápida caminhada até NYC Fast Ferry e outras inúmeras atrações da área. Existem várias opções de restaurantes à beira-mar em frente da propriedade e muitos mais em torno da cidade. Sandy Hook Beach Pass está incluído no aluguel, juntamente com 2 bicicletas Cruiser praia. O trecho de 11 quilômetros de praias espetaculares do oceano e da baía é excelente para a prática de surf, natação e relaxamento na areia. Os amantes da natureza irão deleitar-se com as mais de 300 espécies de aves migratórias, bem como com a floresta de azevinho imaculada. Além de Sandy Hook, existem várias outras praias para escolher, bem como belas Hartshorne Woods para caminhadas. Sea Bright fica a poucos minutos e Asbury Park fica a 15 minutos de carro ao sul. Um belo alpendre para sentar e desfrutar de nascer / pôr do sol sobre Sandy Hook e da Enseada. Totalmente mobilado casa com sala de jantar cozinha completa com todos os novos aparelhos, incluindo máquina de lavar louça, microondas, geladeira e gama. 2 banheiros novos com água quente instantânea e belos box de vidro. O sofá-cama e assento de amor na vida com uma TV de tela plana de 42 'com TV a cabo, Wi-Fi e som estéreo surround. Quarto andar térreo tem casa de banho privativa com portas francesas. O quarto escadas tem uma luz do céu e novo colchão queen size. É um espaço muito confortável. Todos os móveis são mais novos, todos comprados nos últimos três anos. O quintal vem completo com um grande deck e um chuveiro ao ar livre e bar / ela. A propriedade é profissionalmente ajardinada com Butterfly Bush, várias rosas e hortênsias. Great house, very well furnished and equipped. 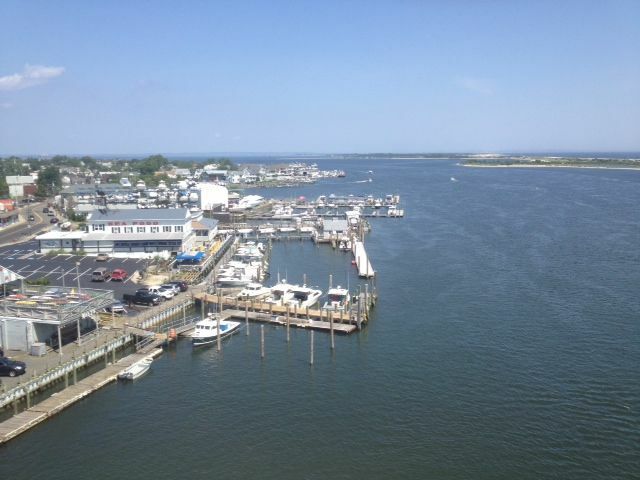 Excellent location to Sandy Hook and local restaurants. Dave was a pleasure to work with. 5 STARS! Bright, modern and comfortable home with all the amenities. Excellent location literally a few steps away from the waterfront and dining. Extremely responsive and accomodatng host. Had a very enjoyable stay . What a cute home! We stayed with my whole family (wife and 2 girls under the age of 5) and we had more than enough space. House was clean and decorated, and the outdoor patio was a great place to hang out and cool off with the outdoor shower and fridge in the shed. With convenient access to beaches and all of the restaurants around Highlands, you can't beat the location. We will definitely be looking to rent again next year if it's available! AWESOME THREE DAY GETAWAY FROM NYC! My partner and I were in need a quick respite from the city. This was the perfect choice! Only an few blocks to the Sea Steak ferry it aloud us to come and go easily without a car. The town is a cute eclectic mix of marinas and fisherman as well as locals and tourists alike. The house is nicely equipped and looks to have been renovated completely. There's a really nice kitchen with a open concept the makes this smaller home feel very spacious. We got a lot of use out of the back patio and outdoor shower. There are many water front dining options. Two excellent ones are right across the street on the water! Front of house was overgrown with “weeds”. Street parking was almost non-existent. Front porch furniture had seen “better days”. Using the washer/dryer was an “event”. Refrigerator was dirty inside & ants were EVERYWHERE in kitchen-including counters. What can I say. I've never received a review like this in the five years I've been renting. These were the most difficult people I have ever had to deal with. We were never even notified that they arrived and despite several attempts to contact them they never responded until well into there stay. They left the house trashed and abused our cleaning help. When they showed up to clean after they should have been checked out. I can say that we have dedicated parking in the front of the house so I'm unclear what the issue was here. Additionally, We pride ourselves on the cleanliness of our unit and use a topped ranked cleaning service to do so. I'm a horticulturist by trade with over 25 years experience. The plantings at the house where selected to need little care. Its a cottage style garden with many flowering plants meant to naturalize. Beyond that I don't know what else I can say here other than the review is completely false. And yes some of the porch furnishings are older. It's a beach house and our second home. We have many many new furnishings in the house and 95% are only 5 years old or less. We bought most furnishings after the house was completely gut renovated and lifted in 2013 post Sandy. In short we have never had less than a 4 star review and only received that twice in our 5 years. All others are 5 star. I wish there was a system in place on VRBO that allowed for tenant reviews. I could warn other owners not to rent to people like this!!! Great place to stay! Clean and comfortable. This place is a gem. Sometimes you roll the dice but this place was as advertised. Clean , comfortable and close to everything. The back patio was our after beach oasis. It was obviously professionally landscaped. It was great to unwind after a day at the beach while the kids were inside, online, playing there devices with the working WiFi. We only cooked breakfast for a couple of days but the kitchen was fully outfitted with any and everything we could have wanted to make all our meals there. Beds were comfortable with clean linens. It was obvious to us that the owners have thought about providing the guests with the small things to make the vacation easy. Could not have been happier with the space. The Sunset from the pier across the street was breathtaking. Thank you for paying attention to the details and we will be back!!! Security deposit is required for all rentals.